Is it me or are the Topshop Vectra slippers everywhere?? 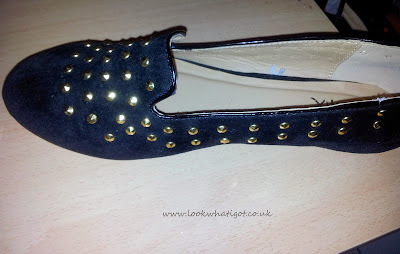 There quite the interesting shoe, with their studded detailing. They caught my attention straight away, whilst I was bobbing my head to The Weekend "House of Balloons", on my way to work. As soon as I saw those beauties, I tore my headphones off and in awe, asked the girl who wore my future shoes the coveted question ....."Where did you get those SHOES? " When I looked online,they were sold out. 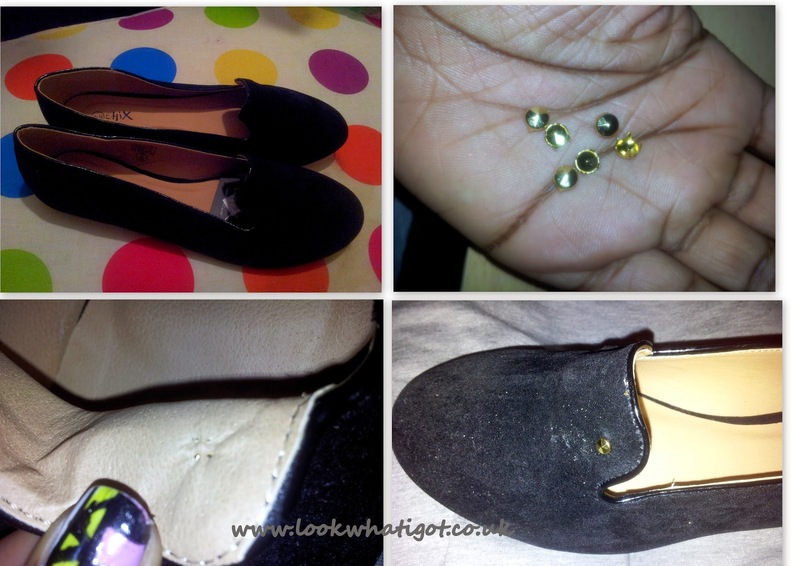 So I decided to make my own and I am gonna show you guys and girls how to create your very own pair of studded slippers. Step 1: Get your materials out. You will need studs,loafers,scissors and patience. Step 2:Decide on your pattern(I am going to stud the whole loafer). Open the studs a little with your finger or scissors. Step 3:Next push the stud in to the shoe and secure it by pushing the spikey bits down with the back of your scissors to prevent it being scratchy on your feet. Cheaper and nicer if I do say so myself.Now I need a name for my new shoe the Jectra studded slipper...no? I will work on the name. Happy D.I.Y-ing.